Belle vande Haflinger Hoev (AHR 19384-01) was imported from Holland as a weanling by Genesis Farm. “Belle” is sired by the two-time Dutch selection Champion, Atlantic. She also comes from one of the strongest mare lines in Holland. Her grand-dam, Beauty, has previously won an impressive three consecutive ‘offspring of mare’ classes. Her lineage is known for its strong movement and Belle is no exception. Belle was AHR inspected as Silver with 79 points in 2010, earning a ‘9’ for overall movement. Belle is the perfect example of versatility—her loaded pedigree combined with great conformation and powerful movement all allow her to excel in breeding, halter, and performance venues. She is one of the foundation breeding mares of Genesis Farm. Belle has produced three foals, all of which were sired by our imported two-time AHR ‘National Champion Stallion’ and two-time AHR ‘Stallion of the Year’, Arno van het Nieshof. Belle’s foals have stood alongside her to win 1st place at the AHR National show in the pleasure “Mare and Foal” classes in both 2006 AND 2007! In addition, in 2007, Belle’s daughters won the draft “Produce of Dam” class on Belle’s behalf! In July 2007, Belle won 1st place at the Buckeye Haflinger Show in the ‘Mare 4 and over’ halter division out of 24 entries! At the 2007 AHR National show, she won 1st place in the pleasure ‘Mare 6 and over’ at halter class, going on to win the title of Senior Champion Pleasure Mare and then eventually National Champion Pleasure Mare for 2007. If that is not enough, Belle also went on to win the pleasure “Best of Show” honor. Belle was the dam in our 1st place entry in the 2007 AHR National show pleasure ‘Mare and Foal’ class and was a vital part of our 1st place entry in the pleasure ‘Best Three Mares’ class. At the end of day devoted to halter classes at the 2007 AHR National Show, Belle had more blue ribbons and championship ribbons than could fit on her halter! She was literally UNDEFEATED in any halter class during the entire show! And, she retired back to her stall that evening next to her daughter, Britney, the 2007 Reserve National Champion Draft mare! What a day!! Also 2007 was only Belle’s second year competing in the performance division at the shows, however she is continuing her winning ways in that venue as well! Belle’s awards under harness and saddle allowed her to become the 2007 AHR National Show “Reserve Pleasure Performance High Point” winner. In 2008, Belle was again an integral part of the Genesis Farm show string. She was ridden and driven in a variety of classes and won several titles. Most notably, Belle won 1st place at the AHR National Show in the Ladies Pleasure Driving Working Mare class for Michele and then went back into the arena shortly thereafter to also claim 1st place in the Men’s Pleasure Driving Working Mare class for John. 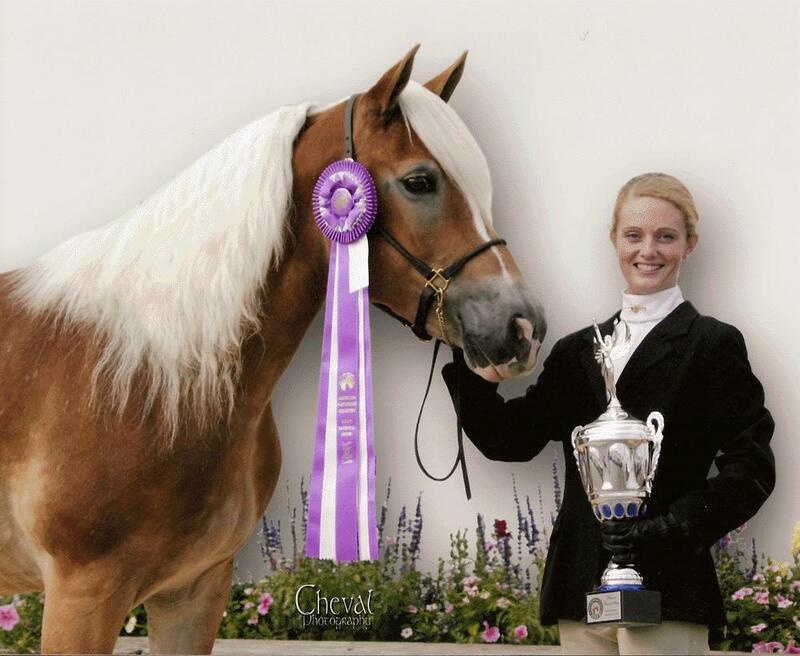 Her awards during the summer months also earned her the title of 2008 Tri-State Challenge Senior Mare Halter Co-Champion and also 2008 Tri-State Challenge Walk-Trot Reserve Champion. In 2010, Belle was AHR silver classified with 79 points, earning an impressive ‘9’ for overall movement. At the Buckeye show that summer, she won 1st place in the ‘Mare 6 and Over’ halter class, going on to be named “Reserve Best in Show” (standing next to her pasture-mate, Faith by Fire, who earned “Best of Show” honors). From halter to harness, from the dressage arena to the hunt course, from the leadline to the open classes, Belle exemplifies the quality importing, breeding and performance program at Genesis Farm!